To deal with the multitude of different fire classes, a range of fire extinguishers have been developed. Please click on the type of extinguisher, this will display more information about that extinguisher type. Water has a great cooling effect on the fuel’s surface and thereby reduces the pyrolysis rate of the fuel. Fires involving organic solid materials such as wood, cloth, paper, plastics, coal etc. These offer significantly improved fire fighting capability compared to traditional jet type water fire extinguishers. Available in 3 and 6 litres. Water has a great cooling effect on the fuel’s surface and thereby reduces the pyrolysis rate of the fuel. Instead of a jet nozzle a spray nozzle is used, with a higher pressure, which creates a fine spray. This allows for a given quantity of water to have a considerable increase in the surface area presented to the fire. This makes extinguishing more efficient by more rapid extraction of heat, formation of steam etc. They can also contain surfactants which help the water penetrate deep into the burning material which increases the effectiveness of the extinguisher. The first broad spectrum extinguisher to tackle A, B, C rated risks as well as fats and deep fat fryers (Class F). Models with dielectric test to 35k Volts can be safely used on electrical fires (up to 1000 Volt) if a safety distance of 1m is adhered to, as their mist (de-ionised water) does not conduct electricity and the extinguisher does not normally form puddles, which could conduct electricity. The UltraFire water mist extinguishers also contain only de-ionised water which cannot carry any electric current. 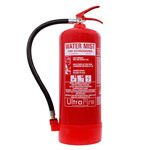 Water mist extinguishers are safe for discharge on all fire classifications bar Class D blazes. Point the jet at the base of the flames and keep it moving across the area of the fire. Ensure that all areas of the fire are out. The fire draws the microscopic water particles into the fire. Smouldering material in deep seated fires such as upholstery or bedding can cause the fire to start up again. Do not use on domestic chip or fat pan fires.There is danger of inhalation if powder extinguishers are used within buildings. Due to this, and the potential for powder to impair vision, powder extinguishers are no longer recommended for use within enclosed spaces. Similarly to almost all extinguishing agents the powder acts as a thermal ballast making the flames too cool for the chemical reactions to continue. Some powders also provide a minor chemical inhibition, although this effect is relatively weak. These powders thus provide rapid knockdown of flame fronts, but may not keep the fire suppressed. The lance enables the user to tackle fires at a safe distance. The low velocity applicator reduces the energy of the jet allowing the powder to gently smother the surface of the burning material thus avoiding scattering the high temperature particles and stimulating the formation of a crust. The method of application is completely different from a standard extinguisher and user training is required. They are not suitable for use on live electrical fires. Do not use on chip or fat pan fires, as it can carry burning fat out of the container. This type of extinguisher does not cool the fire very well and you need to ensure that the fire does not start up again. Fumes from CO2 extinguishers can asphyxiate if used in confined spaces: ventilate the area as soon as the fire has been controlled. Only use CO2 extinguishers with frost-free horns, as the hand holding the horn can otherwise be frozen to the horn, as the gas gets very cold during the discharge. Carbon dioxide extinguishers work by suffocating the fire. Carbon dioxide displaces oxygen in the air. However, once discharged, the CO2 will dissipate quickly and allow access for oxygen again, which can re-ignite the fire. Check manufacturer’s instructions for suitability of use. These extinguishers are usually not recommended for class B fires such as petrol, although Gloria has produced a 3 ltr wet chemical extinguisher with B rating. Apply the wet chemical using the extended applicator in slow circular movements, which gives a gentle, yet highly effective application. Apply the fine spray onto the burning fat until the surface of the burning cooking oil changes into a soapy like substance which prevents re-ignition. The gentle application helps to prevent burning oil splashing out of the container. Make sure that you empty the entire content of the wet chemical extinguisher onto the oil/fat, as the fire can re-ignite otherwise. 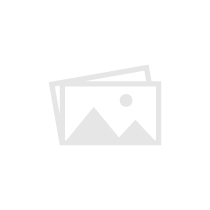 Fire blankets are made of fire resistant materials. They are useful for smothering small pan fires or for wrapping round a person whose clothing is on fire. 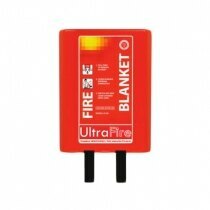 Fire blankets conforming to British Standard BS EN 1869 : 1997 are suitable for use in the home. BS 7944 : 1999 is the specification for specialist heavy duty industrial use. Fire blankets should generally be disposed of after use. Small pan fires where oil or fat has caught fire and clothing fires. While kitemarked fire blankets have been successfully tested on deep fat fryers, modern frying fats are difficult to extinguish with a fire blanket. We therefore recommend wet chemicals for deep fat fryers.